Moses’ siblings complained because he had married a Cushite woman (Num. 12:1). One view says Cush is Upper Egypt; another that it is Ethiopia. 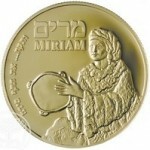 The rabbis took the passage to refer to Zipporah even though she was a Midianite (Mo’ed Katan 16b). Regardless, the problem seems to be that she was dark-skinned. God sternly rebukes Miriam and Aaron for criticising Moses, thus rejecting their apparent prejudice.